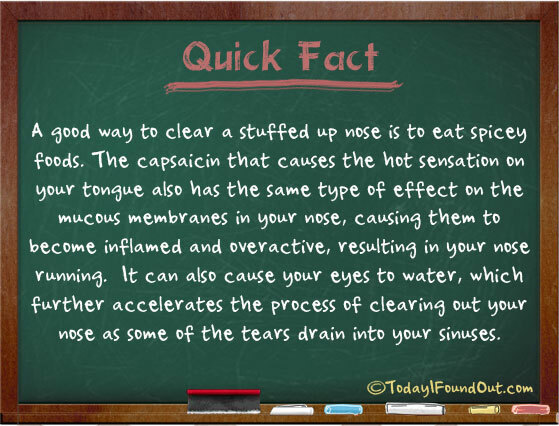 A good way to clear a stuffed up nose is to eat spicey foods. The capsaicin that causes the hot sensation on your tongue also has the same type of effect on the mucous membranes in your nose, causing them to become inflamed and overactive, resulting in your nose running. It can also cause your eyes to water, which further accelerates the process of clearing out your nose as some of the tears drain into your sinuses. When you have a cold, in Mexico people recommend you to eat something really spicy to get ride of the cold. There is no e in spicy; you might want to fix that.